Plasma hogetonen bereiken op zijn minst de pijnlijke gehoorgrens van het menselijk oor ; ze bewegen zich in de omgevings ruimte voort als ionen tot ver boven de 150.000 HZ ! The sound is generated by a high voltage Corona Discharge. An audio signal causes the size of this electric flame to change rapidly, creating elastic sound waves! 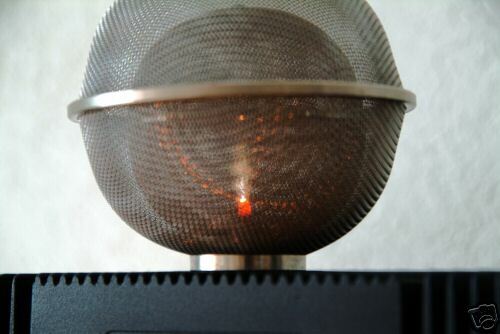 The flame has no practical mass, which implies a perfect transient response and acoustical impedance matching. It also has no directional preference, and thus acts like an omnidirectional acoustic point source! 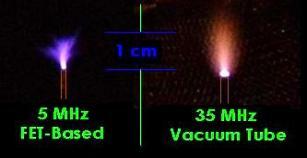 The lower frequency response limit is set by the flame size and is around 2 kHz here as shown. The upper limit is in the MHz! A feedback-driven oscillator passes a current though a Tesla-like coil at its natural resonant frequency to generate high voltage. The audio signal controls the amount of this current changing in the coil, altering the flame size. 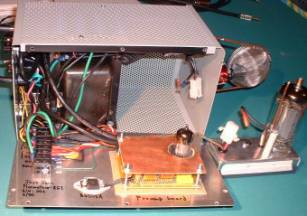 The coil is basically a parallel resonant circuit; high Q, low capacitance and low losses are desirable. 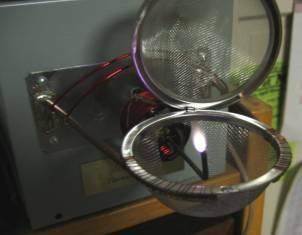 The flame self-sustains as long as the voltage peaks above a critical electric field. For high frequency oscillation (greater than 3 to 4 MHz), the ions cannot move very far in a period and form a region of space charge. This perpetuates the corona flame and keeps it quiet. When ions bombard the electrode, electrons are freed by secondary emission (heating). This sustains the corona and causes sputtering, limiting electrode life. Thoriated tungsten was used in the Ionovac. Increase the flame size! How low can the frequency response go? Increase the power efficiency to make larger flames practical. Linearize the system as a whole. The flame itself is surprisingly linear. I didn’t do a very good job on the audio stages since I wanted to get the concept working. Experiment with Helium gas, which should allow for high acoustic output.